This is a list of pre-release and unused content for the game Mario & Luigi: Dream Team. Early in planning, the developers considered having Bowser be a playable character again, but decided against it to keep the focus on Mario and Luigi. An early prototype featuring a number of Luigis on screen was made during development, and the player had to guide them to a goal without losing any. 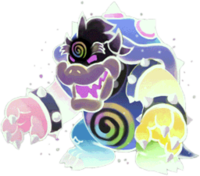 Some sprites of an earlier design of Dreamy Bowser can still be found within the game. A number of leftover sprites from Mario & Luigi: Bowser's Inside Story are also present in the game's files. These include sprites for Mario, Luigi, a Goombule, a Shroob, a Blitty. There are also sprites for some of the Special Attacks in Bowser's Inside Story, including Jump Helmet and Yoo Who Cannon. Some sprites for an Ice Flower attack are also present. ↑ 1.0 1.1 Iwata Asks : Mario & Luigi: Dream Team : Burnt Blank. Nintendo of America. Retrieved February 27, 2015. ↑ Mario & Luigi: Dream Team. The Cutting Room Floor. Retrieved April 1, 2017. This page was last edited on May 2, 2017, at 20:27.